Ok, I admit it; I am a fan of John Oliver. His comedic “news” seems to be well researched and comedic timing is on point. I also know many people who are not fans, who find him to be at best a gadfly who selectively uses misleading information. Regardless of your views on him, he has been able to mobilize large segments of the U.S. population to take action on issues around chicken farmers rights, and net neutrality (twice!). 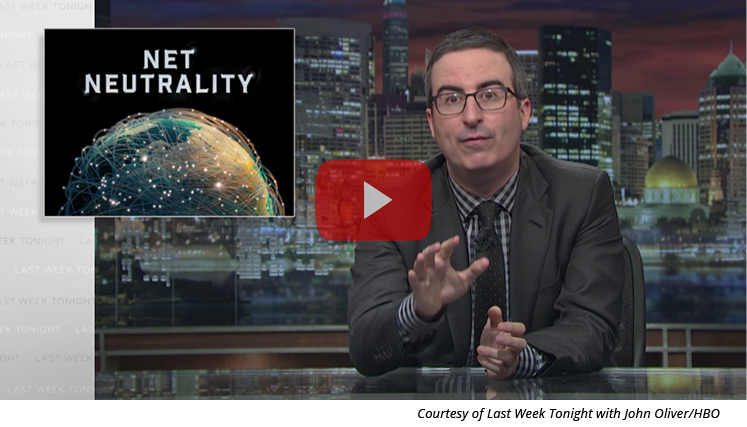 Oliver’s most recent net neutrality campaign took an interesting turn that lead him to this follow up video that points to one of the major issues when mobilizing large segments for a grassroots campaign. This time around, individuals responding to Oliver’s call to action again flooded the FCC’s website. However, some folks used fake names and provided non-germane feedback, which has sparked a call to “cancel out” all the comments. On this notion, comment reviewers can simply put those comment to the side. More troubling is this report from ZDNet. It appears that some of the proponents for getting rid of net neutrality rules are sending mass messages or worse—using a bot to communicate with the FCC. This is not a new problem, but it is one that should be remedied by the group promoting the advocacy effort. Promote letter customizations and allow your letters to be edited. This can help increase the recognition factor when your advocates do take action. Send a response-confirming action to your advocates AND a thank you letter. This helps connect your advocate with your organization and the action you’re asking them to take. Continue to stay in touch with your advocates! Educate your advocates on the process in which they are engaging. Your advocates don’t always understand what they are doing or why that are doing it. As part of the outreach process you should clearly explain why their input is important. These are just a small number of ideas that can help your grassroots outreach; however, each campaign has its own quirks, which need to be included into the strategy for taking action. Further, you should ask some basic questions before the campaign: How do I notify advocates? What do I ask them to do? How do I follow up? What do I measure? Let us know if you want to discuss an upcoming campaign. We’re always eager to apply our expertise to help campaigns win!